Physical training and conditioning are just as important to a prepared lifestyle as spending time on the range with your EDC. Those who make concealed carry a daily practice realize that one of the most vulnerable places they can find themselves is in the middle of a workout, dressed in athletic attire that neither offers the concealment nor the infrastructure to support carrying a weapon. Whether at the gym or on the running trail, the dangers around us don’t pause as we attempt to reach our fitness goals. Amy Robbins discovered this reality while training for her first marathon. While battling to find a balance between security and comfort as she spent her days running in a Dallas park with a history of violent crime, she discovered a market void and set out to create her own athletic clothing line that would facilitate concealed carry. As a result, Alexo Athletica was born. 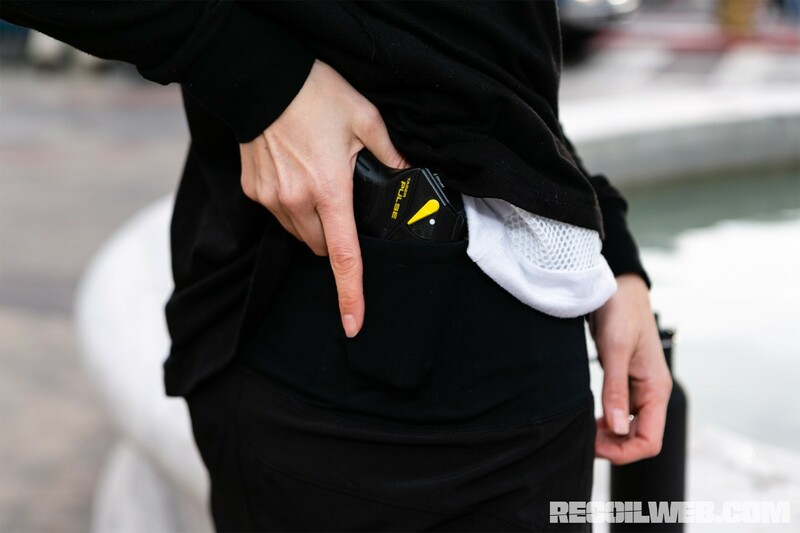 Alexo, literally meaning to defend, entered the scene in 2017 with their ladies Signature Pant, a nine-pocket concealed-carry legging that offers three integrated holster pockets, and eventually followed up with their Fit n’ Flow concealment cover jacket. As their loyal customers have anxiously awaited to see what new things are on the horizon, we were able to get an exclusive first look at the Alexo 2019 Spring Collection during SHOT Show. As if pistol-packing leggings weren’t impressive enough, Alexo will soon be introducing the first-ever concealed-carry running short. Yes, that’s right. 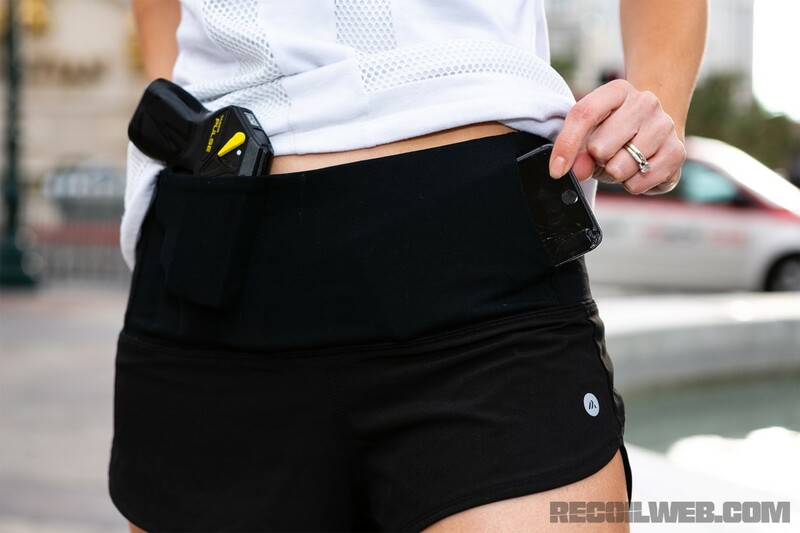 Alexo has integrated the same concealed-carry technology from their leggings into a stylish running short. These new shorts feature a reinforced waistband with seven pockets to carry all your EDC essentials. There are three designated specialty pockets, one at the appendix and one on each hip, for securely carrying a taser, blade, chemical agent, small firearm (up to 23 oz loaded) or other defensive tools. These also pockets include the same double-pocket trigger guard system found on the Signature Pant. When covered with a semi-loose-fitting top, these running shorts looks like any other loose-fitting, high-cut running short. No need to look far for those cover garments either. The Mesh Cupro Tank from Alexo offers a strategic front mesh detail that helps minimize printing and is perfect as a base garment for layering. The re-release of the Mesh Tank this Spring will include black, grey, and a white version. Also new for 2019 is the Hi Lo Lightweight Cupro Sweater in black, grey, and white. This bi-level design layers with the Mesh Cupro Tank to help conceal whatever you might be carrying in your Alexo leggings or shorts. The back of the sweater is cut slightly longer to give a little extra coverage to the backside while running around town. The sleeves have thumb holes to keep the hands warm during cooler weather. Finally, Alexo’s bestselling Fit n’ Flow Jacket will be hitting the shelves in two brand new colored linings, Warrior Princess Blue and Olive Green. These water-resistant jackets are designed for everyday wear with additional storage pockets for everyday items and personal protection tools.